Vittoria M. Fariello, a native of Turin, Italy, who has also lived in France, Germany, Canada, and Egypt, is an experienced investigator and litigator who is also responsible for any deals and transactional matters covered by the Firm. 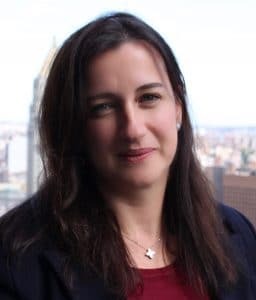 Prior to joining Balestriere Fariello, Ms. Fariello worked as an Investigative Attorney in the New York City Buildings Special Investigation Unit (a joint initiative of the City’s Departments of Investigation and Buildings). There she worked with investigators and analysts to conduct a variety of investigations into professional misconduct and official corruption matters and litigated and tried cases based on those investigations. She also worked with local prosecutors, regulators, and other government attorneys on broad investigations and complex litigation matters. Before working with the Special Investigations Unit, Ms. Fariello worked at a small firm where she handled several kinds of litigation matters and a variety of transactional matters, including residential and commercial real estate deals. During Law School, Ms. Fariello worked for the Chief Prosecutor in Milan, Italy, investigating corruption in the Italian government; for the Immigration Unit of the Legal Aid Society, representing individuals in asylum and other matters before immigration courts; for the ambassador of the Arab League to the United Nations in a series of diplomatic projects; and for an attorney at the international firm Spector and Feldman, LLP. Outside of attending Cardozo Law School and the University of Wisconsin, Ms. Fariello spent semesters abroad at La Cattolica in Milan, Italy and the American University in Cairo, Egypt. Ms. Fariello is an associate of SUNSGLOW (Study of the United Nations and Global Legal Order), a non-governmental organization which trains lawyers and judges in developing countries.